As much as I might like them in their regular roles, Ed, Al and Chris are not at their best when anchoring live news events. This past Monday, our nation experienced its most recent mass shooting tragedy when 12 workers at a US military installation in the District of Columbia were killed and 14 were wounded when a lone gunman opened fire on a crowded atrium within the Naval Sea Systems Command headquarters building at the beginning of the work day. At around 8:20AM, Aaron Alexis, a 34-year old defense subcontractor and former Navy reservist, drove his rental car inside that defense-related installation with a recently purchased shotgun and 24 rounds of ammunition (he would also acquire a 9mm semi-automatic pistol from a security officer he shot on his way to that electronically protected main building and possibly one more from an internal official) and made his way to a strategic position on a 4th floor walkway overlooking that congested food service area during their breakfast service. Facility and district law enforcement officials responded within 2-3 minutes of the 911 call and eventually encountered Alexis along the walkway. After wounding an officer and at the end of an approximately 30 minute standoff, he was fatally shot and killed at around 9AM. These are facts that, in the span of 24 to 48 hours after-the-fact can be succinctly conveyed in a 12-line area of a blog; however, in the immediate aftermath of such a rapidly evolving event, brevity and clarity is nearly non-existent and these scenarios pose significant impediments to those who have been trained to tell us the news. A much more dire situation occurs when we must endure this process with people who have no formal journalism backgrounds and must ramble on because they must fill their outlet's unlimited air time and I personally witnessed that embarrassment on Monday afternoon on MSNBC. We are now starting to get information about Aaron Alexis. He did spend two years in the Navy Reserves. He came into the Reserves, pinned in December 16th of 2009 and was separated from Navy Reserves in January of 201, just over 24 months in Navy Reserves. And this, of course, has been a day of trying to piece information together but I think that we can come to the conclusion that if he was in the Navy Reserves, officials do know a lot more about this man than what they are saying. Craig, a number of questions I have here. Do we know how he got in the facility? He used someone else's identification card. Are authorities there telling us how he got ahold of that? And it's been reported that some 3,000 people work in this facility and some areas are more secure than others. Is that how you understand it? In Schultz's defense, he was working with some incorrect information that Melvin--someone with some actual news-gathering and reporting experience--seemed to be concurring with. It turned out that Alexis actually entered the military in 2007 and served at a Fort Worth base up until January 2011, a span of between three and four years--not the two that was being mentioned in this and an upcoming conversation. It was also determined that the gunman used his own Navy-issued identification card instead of perhaps stealing someone else's--a clue that would initially point to a possible accomplice (early reporting had another person's card in proximity to Alexis after the police shot and killed him). The last inquiry above is a valid question for someone who is not familiar with military installations or Department of Defense organizations. 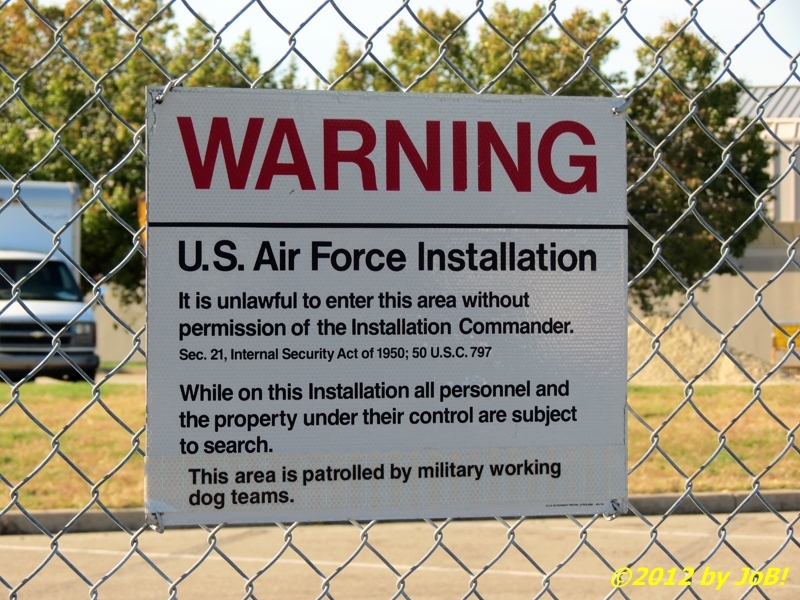 One of the warning signs that hangs on the exterior fence at Wright-Patterson Air Force Base. With 30+ years of personal experience in those environments, I would never have even thought of asking that question because it is second-nature to see mixed levels of assigned protection on a single installation. As a defense contractor, I have an government-issued Common Access Card, or CAC for short, that affords me entry to nearly any military base I would need to visit if related to my assigned duties (and my retiree ID card would work just as well for any others). 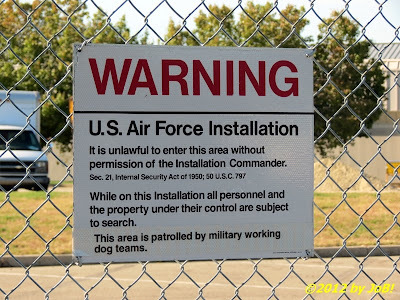 Military installations are normally considered "controlled areas"--areas where sensitive information or operations occur and require limitations of access by security personnel. Within that larger area can be "restricted areas", facilities or properties where special measures are required to minimize incursions and/or interference with extremely sensitive information or activities. What kind of security is expected at a facility like this? So he many have just had a card and gone through, shown his card and he's in? So he goes in with an AR-15, a double-barrel shotgun...I'm curious as to how that was concealed or was it already on campus? Now it hasn't been reported but are we to assume that the Navy knows exactly who this guy is? I mean, if he spent two years in the Reserves, which is unusual and I want to ask you about that, wouldn't they know who this guy is and know everything about him? To be in the Navy Reserves for just a little over two years and then was separated from the Navy Reserves which is rather unusual...what about that? So we can assume that he may have been discharged. Would there be a record of his behavior? But you can say, unequivocally, it's unusual that someone would be in Navy Reserves for two years? His job, his occupation, was a Navy aviation electrian's mate focused on electrical systems aboard aircraft. He was in training...I mean, I think that we can make the assumption that being a mate, he didn't go there with the skills, he was developing these skills. To get into the facility, are there people on the facility that carry firearms? So, on naval facilities--all military installations in this country--I would imagine the military, from the top down, is going to be reviewing all their security...this is going to change. Would you say this is going to change things on military installations in America? Is this a product of lax security? What do they do at this facility? What is the Naval Sea Command Center? To his credit, he was in "receive mode" and taking everything COL Jacobs was telling him at face value. Unfortunately, the retired Army officer was providing him some incorrect and/or outdated information and seemed to be rolling all military services and installations up together into his fading recollection of how things were when he retired in 1987--over a quarter of a century ago. My local base discontinued registering privately owned vehicles back in 2007 and the Navy stopped doing this across all of their installations effective this past July 1st. The rationale was two-fold: it really did not provide a valid increase in security (they served only as a visible indicator to entry officials that the car was registered in some state and insured--such an overt decal actually made owners more susceptible to terrorism in our post 9/11 world) and its termination helped save money that could be applied elsewhere in cash-strapped military budgets (one estimate shows a $750,000 per year savings across that one service). The new electronic verification system (shown below) only focuses on the operator and occupants of the vehicle and provides an instant check to determine if the presented identification is valid (or to see if non-DoD items have not expired). It would be later determined that the shooter used his own card and probably had the disassembled shotgun inside a bag he had inside his rental car and then took that (along with the security officer's pistol) into the headquarters building. An unidentified gate guard at Wright-Patterson Air Force base uses a Defense Biometrics Identification System scanner to quickly authenticate a valid a Common Access Card, or CAC, in November 2011 (US Air Force photo by Staff Sergeant Phillip Butterfield). He was also a little unsure of the enlistment obligations for Navy Reserve members (their web site states that current obligations for initial entrants--the category that Alexis would have been in 2007 when he joined--range between two and eight years). Not to get too "inside baseball" here but every member who enlists in the US military actually incurs an 8-year military service obligation, or MSO; however, all that time is not necessarily spent in uniform. A member can leave active duty or active status prior to the end of that MSO period but the remaining time must be served in the Individual Ready Rerserve, or IRR, which, for most of them, is a paperwork exercise. The former Navy Reservist was given a general discharge in 2011 (it was later upgraded to an honorable discharge upon appeal) and that administrative action terminated his MSO commitment. I believe I know where Schultz and Jacobs were going on that line of speculation but they should have gotten their facts confirmed first before they started down that personal behavior speculation path. 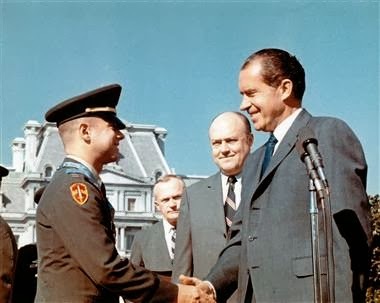 Then-Captain Jack Jacobs was awarded the Medal of Honor by President Nixon on Oct. 9, 1969 on the south lawn of the White House. While it sounds like I am coming down hard on a fellow former military member, he did get some things right. Very few people at the Navy Yard would be openly carrying weapons because of the reasons he gave (no combatant forces assigned to that specific location) and the responsibility for physical security was, at best, a mixture of military members and contractors (the first victim, security guard Richard "Mike" Ridgell, worked for an unnamed private security firm). He identified Alexis as "a fairly low-ranking enlisted" and his grade, petty officer third class or PO3, is the first level of supervision in that service's enlisted corps. He was also correct in saying that US military installations around the world would be reviewing their security procedures, just like they did after the 9/11 attacks; however, he forgot to mention the more recent--and eerily similar--shooting event at the Army's Fort Hood when Army major Nadal Hassan killed 13 soldiers at the post's deployment readiness processing center in November 2009. In the wake of that incident, many bases--including Wright-Patterson, were directed to institute "active shooter" protocols to train the installation populace on how best to deal with an armed intruder, no matter if it comes from an external threat or from an "insider". In the hours after Monday's shooting, local base officials did review their existing plans and needed to make only minor modifications in response to Monday's shootings and to finalize security arrangements for this today's running of the Air Force Marathon. CBS News' senior correspondent John Miller is one of television news' "go-to" people on matters of national security, intelligence and law enforcement. One of the most vital tools an "expert" analyst is supposed to have in their professional repertoire is currency--the state of being current or up-to-date on the subjects in which they profess expertise. I am a frequent watcher of CBS News programming and John Miller, one of that organization's senior correspondents, has attracted my attention over the past year or so with his numerous insightful contributions during their coverage of the Newtown school massacre, the Edward Snowden/NSA information releases, the Boston Marathon bombing, the Syrian crisis as well as Monday's shooting. While already a professionally trained journalist and government spokesman, Miller served stints in both the law enforcement and counterterrorism fields in major metropolitan and national-level organizations. On September 11, 2001 while working at ABC News, he sat next to the late anchor Peter Jennings to radio communications between FBI officials and New York City police and fire department personnel and provide his colleague with regular updates on the unfolding situation. He can be seen on their morning or evening news shows almost on a daily basis and possesses this "currency" to enhance his credibility to the television audience. In contrast, Jacobs' biography shows no recent direct relations with present-day military officials (in his segment with Schultz, he said that he used to teach at neighboring Fort McNair but that would have been back in the early to mid 1980s). After retiring from the Army after 21 years of service, Jacobs went into the financial and investment banking sectors (perhaps CNBC would be a better fit for him?) and wrote his memoir in 2008. It does list him as holding the McDermott Chair of Politics at the US Military Academy but, unfortunately, West Point is not the "E" ring of the Pentagon and his actual face time with senior service leadership would be limited. Again, I hold no ill will towards this American military hero but much like a fellow Vietnam War hero's recent confusion concerning the 21st century relevance of the Russian newspaper Pravda, I believe that after his less-than-stellar performance on Monday, MSNBC needs to look for a more "current" face for that highly visible role. Melvin joins Sharpton in that initial segment and rehashes many of the same of false items from the previous hour (second suspect, the use of another person's ID card, ) but he did make a few corrections based upon information obtained from their "parent" organization, NBC News (Alexis' service period was corrected by the host to reflect the 2007 entry date). With a background consisting primarily of preaching, promotion and activism, he did not look comfortable in an actual journalistic role and appeared to be "parroting" lines fed to him by his producers or inferred by his on-air reporter. Pete Williams, NBC News' legal correspondent and possessor of a professional reputation on par with or possibly even better than CBS's Miller, gave an excellent example of how an experienced journalist reports on a steadily shifting story. His strategic use of quantifiers ("according to this version of accounts", "we believe", "it's not clear", "initially") during that 4-minute span seemed to put a damper on the Keith Olbermann-like "special comment", politically charged words Matthews used to start his program. 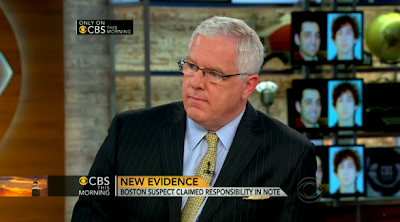 Those also stood in stark contrast to the reports Melvin filed during the earlier shows and depicts a very noticeable stratification between journalists who regularly appear on the "Peacock Network" and those who appear on its "second string" cable outlet. Saturday Night Live provided a humorous skit about several MSNBC hosts' "funky" mood following the first presidential debate of the 2012 campaign. This practice of "pundit-tizing" live news events has not gone unnoticed in wider media circles. Last fall, I posted about a Saturday Night Live parody that highlighted their shoddy coverage of the first presidential debate between Barack Obama and Mitt Romney. To NBC's credit, they were showing the event on two outlets (network and cable) and their "A team" was focused on the broadcast presentation. NBC Nightly News anchor Brian Williams was joined in his New York studio by Meet the Press host David Gregory and Today co-host Savannah Guthrie; their political director, the multi-roled Chuck Todd, chief foreign affairs correspondent Andrea Mitchell and special correspondent/anchor emeritus Tom Brokaw provided post-debate analysis from Denver. Both Todd and Mitchell have their own daytime programs on MSNBC but they were clearly wearing their "varsity jerseys" on that night and for other high-visibility election-related coverage during the last few months of that campaign (to include election night). With all of their legitimate news talent already spoken for, the only choice NBC News had was to put the hosts of their politically focused primetime programming on camera to conduct a pro-Obama "spin-a-thon" to viewers who wanted such coverage and, due to the president's lackluster showing, their obvious displeasure and near-depression caught the attention of the late night comedy writers. As much as I might deride the Fox News Channel, they seem to understand the concept of putting real journalists on the air when breaking news is happening. They recently announced a shuffling of the primetime programming lineup and one of the things it highlighted was the fact that chief news anchor and managing editor Shepard Smith will be available throughout that 4-hour span to interrupt with news updates, sparing the likes of ideological hosts Greta van Susteran, Bill O'Reilly, Megyn Kelly or Sean Hannity the embarrassment of trying to pretend to "corral" a major news story as it is unfolding. Perhaps MSNBC can take the hint from their competition located just across the Avenue of the Americas and employ a similar face-saving strategy for their cable news operation.